What could possibly make deviled eggs even more amazing? By filling them with savory ‘nduja and topping it off with a crispy prosciutto vinaigrette. Chef Thomas Broder of Minneapolis Specialist restaurant, TERZO and family-owned Broders’, created this dish specifically to showcase Prosciutto di Parma at the whole-hog culinary competition Cochon555. The ‘nduja gives these small bites a kick of spice while the tangy vinaigrette provides a refreshing flavor with a crunch from the crispy prosciutto. 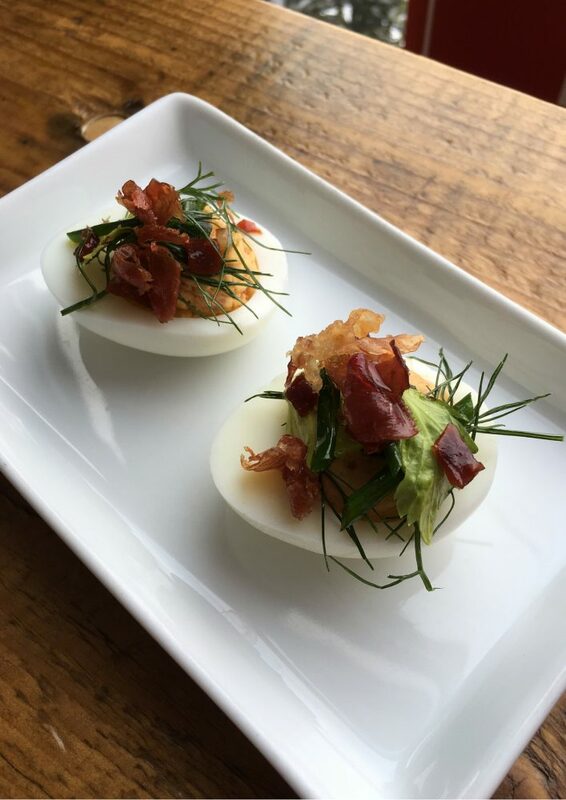 These deviled eggs pair perfectly with a light beer such as an ale or German Hefeweizen. Find more Prosciutto di Parma beer pairings here. Start by cutting the cooked eggs in half like a traditional deviled egg. Separate the egg yolks from the whites. Set aside whites. Using a fork, mix the egg yolks with the ‘nduja. Combine the mayonnaise with the garlic, lemon zest, lemon juice and chopped parsley. Add a couple spoons of the mayonnaise mixture to your egg yolk mixture and mix. Combine the rest of the mayonnaise mixture and stir until well incorporated. Taste your filling and adjust to your personal liking. Scoop the filling into a pastry bag or a plastic storage bag with one corner cut off. Pipe the deviled egg mixture into the egg whites. Fry some sage leaves in a high sided pan with a shallow amount of oil, for about a minute or so at 325° F. Pick a small handful of parsley leaves, light green celery leaves and fennel fronds. Toss the fronds and leaves with a small amount of the prosciutto vinaigrette and garnish each egg. Place half of a fried sage leaf on each egg or more to your liking. Sprinkle the crispy prosciutto from on top. Combine the diced prosciutto with the canola oil in a small sauce pot, with high sides. Crisp the prosciutto over low to medium heat. Once crisp, remove from the pot and reserve for garnishing. Turn the heat down on your pot; add the garlic and brown sugar. Stir for 60 seconds to dissolve the brown sugar. Slowly add the vinegar and olive oil. Be careful when adding vinegar to warm oils. If the oil is too warm, the mixture could boil up and over the sides of your pot. Allow the vinaigrette to cool to room temperature and the flavors to marry before using.